A campaign from John Hancock highlights how the rapidly changing world is impacting the lives and financial needs of consumers and the ways in which a transformed John Hancock can help address those needs. The effort, themed “Different World. Different Approach,” includes TV and digital ads. It was created by the financial service company’s longtime advertising agency, Hill Holliday. Two spots portray Americans’ evolving notions of the meaning of family and the new realities of achieving and building wealth. The ads direct viewers to a digital content hub, which features articles, information, video and infographics provided by The Wall Street Journal and Forbes, as well as content created by John Hancock, and information about John Hancock’s investments, retirement and insurance products. 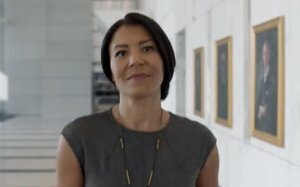 The campaign encourages viewers to think about John Hancock in a new way, and aims to set the tone for further conversation with their financial advisor and with John Hancock, said Kate Ardini, head of brand strategy and advertising. The campaign’s objective is to reflect the momentum and innovation John Hancock has as an organization and to drive interest in its products. It is aimed at affluent consumers, ages 35-64. "CEO" opens in a traditional and formal office setting. As the camera pans slowly down a hallway lined with portraits of past CEOs, all older white men, a young Hispanic woman enters the frame and walks down the hall. We then see that she is portrayed in the final CEO painting. The camera stops at this portrait as the woman exits from view, and the ad concludes with the voiceover. The ads will air during network college football programming and on the NFL Network. The campaign will also be promoted via John Hancock’s social media channels and partnerships with digital content distribution networks. “By staying true to our advertising legacy but offering a more inspiring tone, we hope to transform perception of John Hancock from a trusted and respected company known for delivering on real-life needs to a trusted and admired financial services company that has innovative solutions that put customer needs first,” Ardini says.